This revolutionary app, “Awakenings with Iyanla Vanzant,” promises an extremely personal spiritual coaching session that’s customized for you every single day. Daily guided spiritual principles uplift you to live your best life with Iyanla’s powerful coaching and soothing voice…anytime, any day. 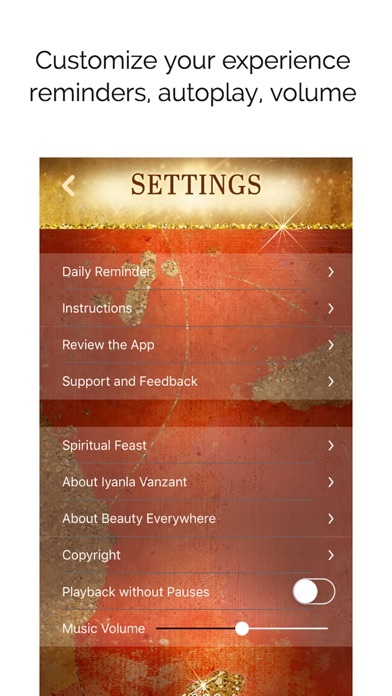 Host and executive producer of the No.1 reality show on OWN: Oprah Winfrey Network, Iyanla Vanzant now offers her new Daily Spiritual Coaching App. Known for her award-winning breakout hit “Iyanla: Fix My Life,” where she goes behind closed doors and deep inside people’s lives revealing emotionally riveting experiences, Iyanla applies spiritual principles to help people gain inner peace and guidance on a path to healing. 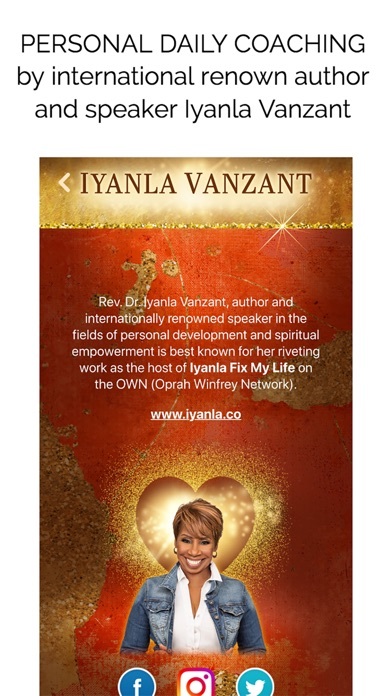 Now you can get your own personalized pep-talk from Iyanla Vanzant every single day. 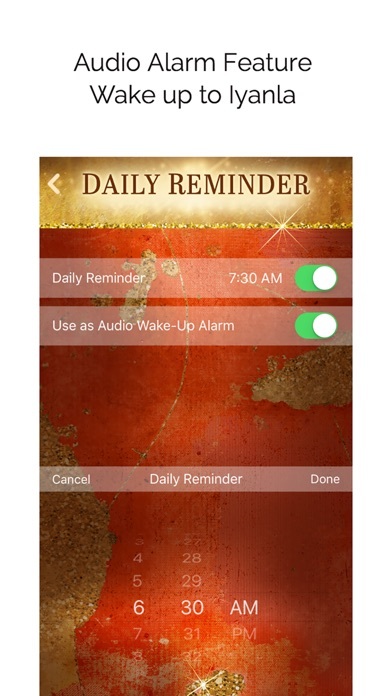 With our Alarm feature you can wake up to a custom spiritual coaching lesson from Iyanla instead of that annoying alarm in the morning. With the reminder feature, you can choose the time each day you’d like to be reminded for your custom spiritual coaching lesson from Iyanla. For example, listen after waking up, during lunch or just before bed as Iyanla’s magical soothing voice leads you through your own daily principles and affirmations toward gaining your own guidance and inner peace. 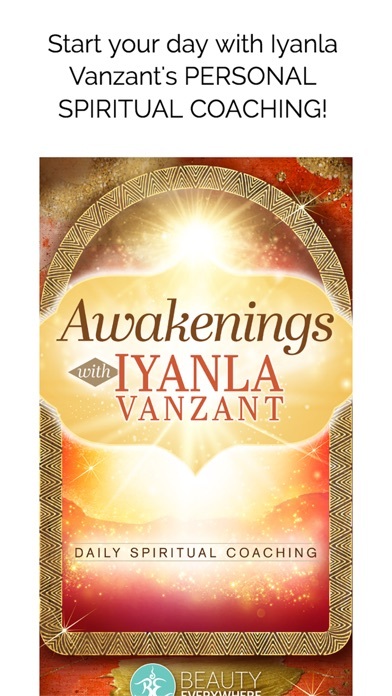 Awakenings with Iyanla is completely free and will guide you through three weekly principles. 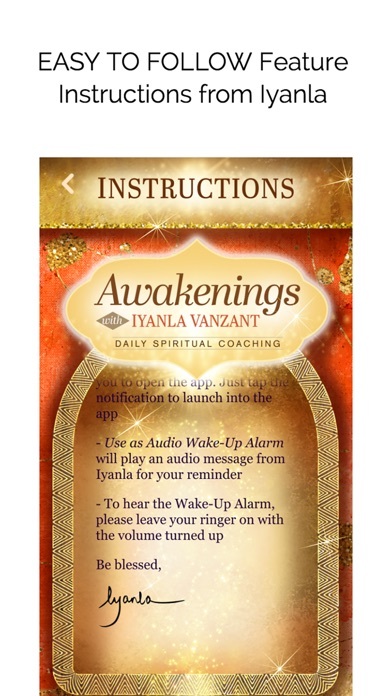 After that, by subscription, gain access to the full Awakenings with Iyanla Vanzant app features including 3 personal daily guiding principles, alarm feature and exclusive access to Iyanla’s Spiritual Feast audio. Each day, spend just three minutes listening as Iyanla delivers three personalized principles she has selected just for you. I truly love the idea of this app and how Iyanla does it. But I heard the perfect messages on day one and now can’t ever hear them again to truly absorb them. Day two’s messages didn’t strike me the same way and I feel like I missed out on something wonderful and helpful. Sad. The music is beautiful and the daily message are perfect. They encourage reflection, journaling and meditation! Well done!!! I really thought I was getting more for my money👎🏼 Unless I’m missing something.... these 3points a day is not worth $29.99! Honestly if I would’ve known this is what it was going to be I wouldn’t have joined. I DO NOT RECOMMEND THIS. Always good vibes and energy. Makes information clear and understandable. Relatable and detailed which makes it easier to see how applicable the suggestions and information really is no matter the position or disposition you are in on the path of life. I have been part of Iyanla’s tribe for many years as a student in New York. This is the finest moment in terms of tapping into my own power and acknowledging who I am and my contribution to this world. She get nothing but praise for her position as Gods Messenger of Healing.